It’s certainly been a long time since this happened to 116 – our robot drove, and even manipulated game pieces, before it was shipped! 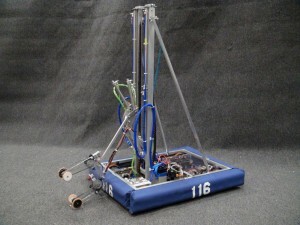 Well done to the team this year, for creating a great-looking robot. Next tasks include flight team try-outs, pit crew selection, pit display and spirit planning, and our withholding allowance projects. In addition, the Inventor team will make their award submission at the beginning of March. Our post-build-season meetings will be held on Tuesdays and Thursdays from 7p – 10p at the robot shop.